Sittuyin is Burmese Chess, Chess played in Burma. It is one of the most original Chess variety played in the World, and it would merit much more attention. The game is played over a uncheckered 64-squares board, with the long diagonals often marked. At the beginning, only the Pawns are placed. The other pieces are placed after, starting by Red first, followed then by Black. This constitutes the most characteristic of that variety of Chess. This freedom in placement is probably a local answer to the slowness of development of the ancient Arab-Indian game. 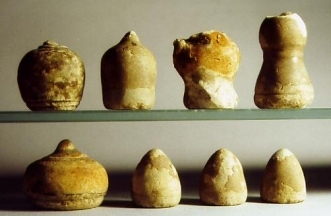 It is comparable, although more modern and efficient, than the Ta'biya in Shatranj (players chosen a determined starting arrangement) or the Werera in Senterej (Ethiopian Chess, players were playing as many moves as they wanted at high speed until the first capture). 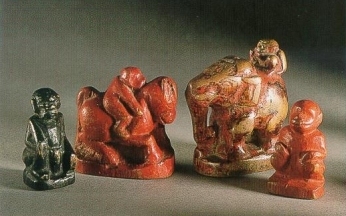 The moves of the pieces come from ancient India. 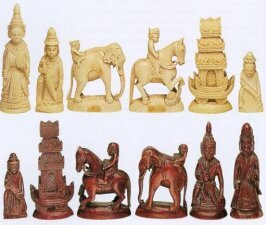 They are those encountered in Thailand and Cambodia.The main difference is small and is related to the Pawn promotion which is here obtained when the Pawn cross the long diagonal ahead. Like in other Asian countries, the Queen and Bishop are here a General and an Elephant and their move are the old 1-step move on 4 and 5 directions respectively. Influenced by Hindu culture, the Chariot was sometimes represented like a Boat carrying a shrine over wheels. In rougher works, some carvers finally omitted the wheels, or even the boat, leaving a kind of temple or tower, maybe under European influence. Comparable designs have been found in India. 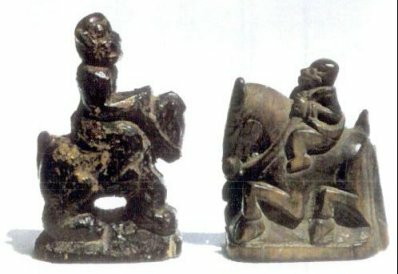 In honor of the legend of Rama, when the monkeys defeated the demons, the Pawns and the Riders are often carved as monkeys. Pronounced "siturin", the word denotes a affiliation with Sanskrit Chaturanga. At present time, it is impossible to determine whether Chess were imported directly from neighboring India like Buddhism which is the predominant religion, or from Siam (Thailand) or even Java, themselves being indianized kingdoms in the end of the first millennium. Like Makruk, Sittuyin was not known until a relatively late time. First report was made by Major Symes, British ambassador, in 1800, confirmed by Captain Cox who had lived in the court of Amarapura in 1801. Later, Doctor Adolf Bastian made a description in 1863. However, all these early descriptions were rather approximate. Some confusion occurred, but this period ended with the publication of the first Burmese Chess Guide : Myan-ma sit bayin lan-nyunt sa-ok gyi directed by Shwei-gyin U Bha in 1924 (source Pritchard). Alessandro Sanvito (catalogo a cura di), "L'arte degli scacchi", Edizioni Sylvestre Bonnard, 2000. Gareth Williams, "Master Pieces", Apple Press, London, 2000. Manfred A.J.Eder, "The Present State of Research regarding the Oldest Chessmen", paper presented at 9th Congress of Chess Collectors International, May 2000, Florence Italy. 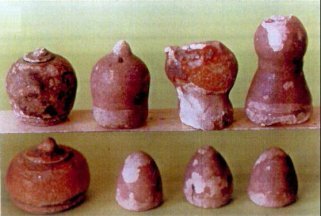 Paper reproduced in "Chess originated in India. Four Contributions", Fördekreis Schach-Geschichtsforschung e.V. publication, May 2000.